Rose of Sharon Retreat sleeps up to six with discount at our nearby salon. 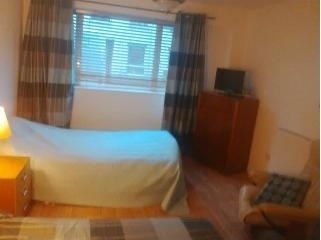 Studio apartment situated 5 mins walk from the seaside is in the small coastal town of Largs. Substantial discount shall be given for weekly stays. Discount also available for single person. We have a salon called Rose of Sharon in the same street and all beauty treatments are available at a discounted price.Our tea garden is always open weather dependent....come and relax in a private setting. Massage can be arranged on site at an extra price.